Members of the Orchis genus (part of the Orchidaceae family) are woodland and swamp plants that are grown form hardy bulbs. 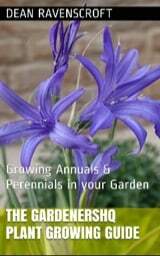 They typically range in height from 30 to 60 cm and flower from late spring through to summer. 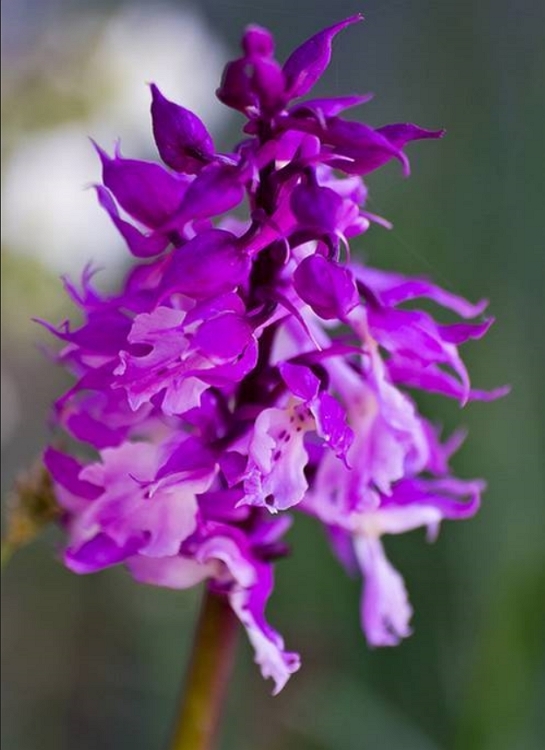 Orchis carries spotted lipped flowers of purple, white or pink. Some common names for Orchis include Orchid and Gandergoose. ?Orchis mascula picture by mr.bong.bing. Orchis Morio also referred to as Anacamptis morio (Green Veined Orchid) by Bernd Heynold. Orchis bouffon photograph by cercamon; CC. Common Names: Green-veined orchid, Italian Orchis, Monkey orchid, Three-toothed orchid, Gandergoose. Native: Europe, Asia, and Northwest Africa. Flowers: Species dependent: Late spring through to summer. Flower Details: Terminal spikes. Lipped. Spotted. Purple, yellow, red, white, pink. Small. Flowers form from the base upwards (except in Orchis simian, which is reversed). Foliage: Variable, often sheaved. Green. Plant Outside: Tubers: 3 to 4 inches (8 to 10 cm). Start of April. Sow Inside: Sow on surface. Germination time: three months to one year. Temperature: 65°F (24°C). Requires light. Transplant outdoors following the last frost. Spacing 4 to 6 inches (10—15 cm). 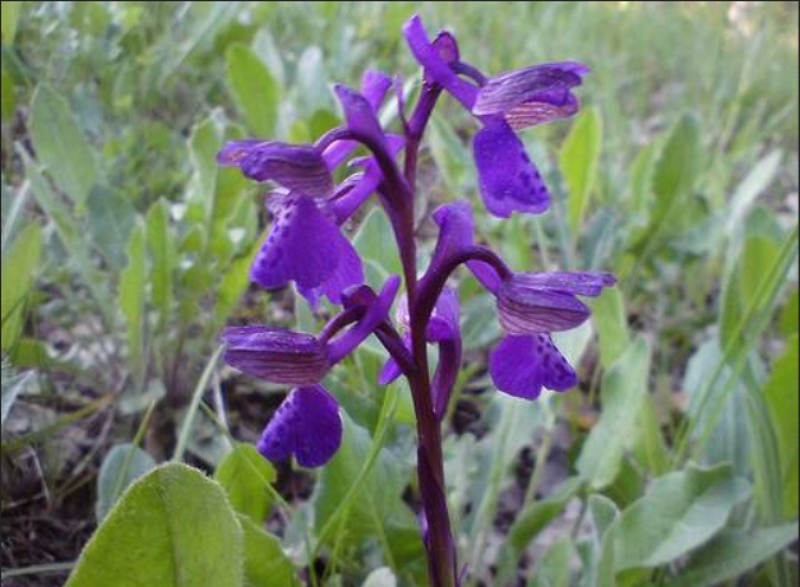 Requirements and care: Orchis is a large genus and specific species have specific needs that cannot be covered in full in a genus specific quick growing guide. Full sunlight through to light shade. Acidic soil pH. Rich, peaty soil. Do not disturb once established. Regular watering during dry periods. Propagate: by dividing towards the end of autumn. Miscellaneous: Named after the Greek word for testicle (ὄρχις) due the appearance of its tubers. Orchis genus plants such asthe Green Veined Orchid can be started from seeds or roots. If growing from roots then they should be buried about 8 to 10 cm deep into a slightly acidic soil that is rich and peaty. Orchis can grow in either sunny or lightly shaded parts of the garden and should be grown about 10 to 15 cm apart. If you plan to grow Orchids from seeds then it is best to start them off indoors. The seed should be sown on the soil surface and germinated at 18 to 24 degrees centigrade in the light. The germination time varies from 3 months to just over a year, so sow the seeds at any time, but only put the seedlings (young bulblets) outdoors following the last frost of spring.